This is a whole new level of "Paleo," guys. 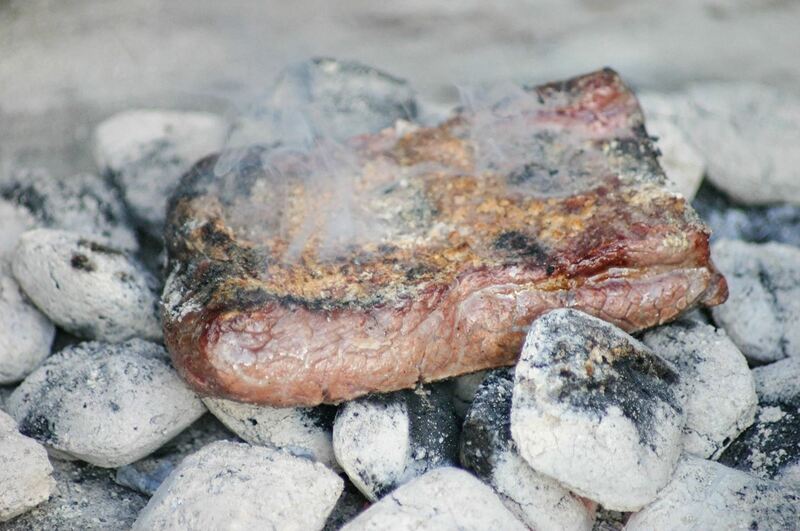 Seriously: there's nothing more primal than a giant hunk of meat cooked in direct flame. Fancy grills and grill masters be damned—this method of cooking your meat is both the past and the future. 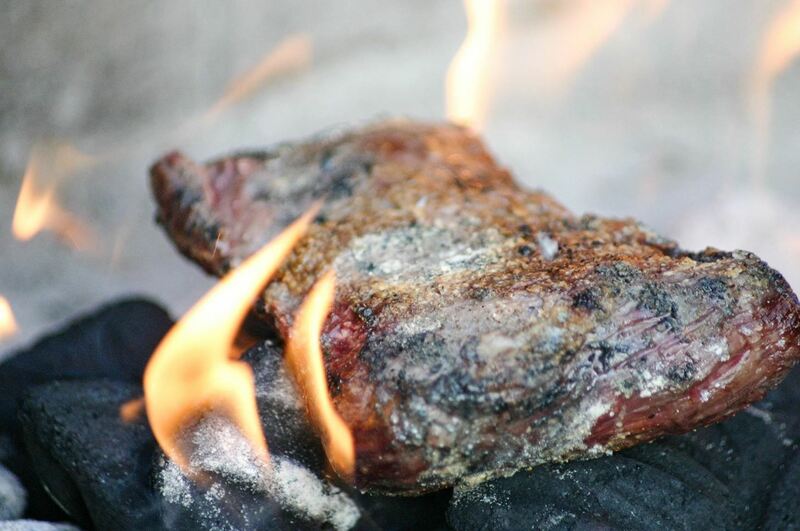 Clinching, or "dirty" grilling, is a technique where you grill directly onto hot coals, allowing the hot flames to come into direct contact with the meat. 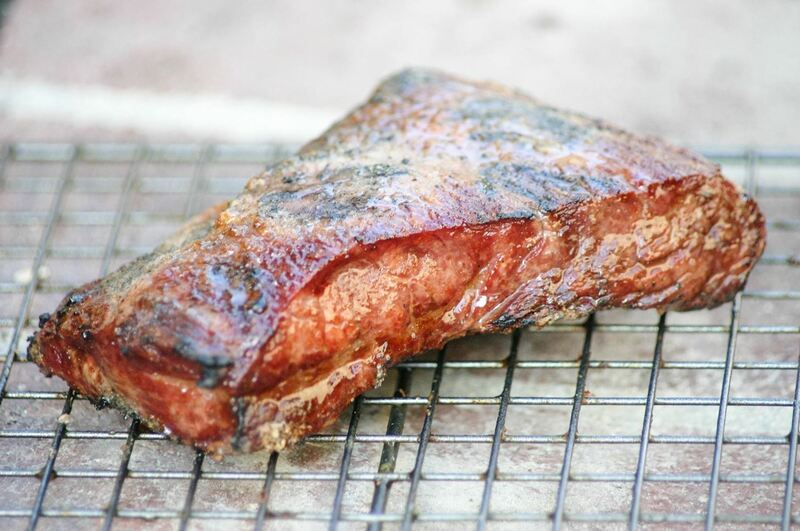 This creates a smoky, charred flavor that just can't be replicated by using a standard grill... while still keeping the inside juicy and tender. Best of all, the steak's proximity to the heat means that it cooks up in no time. While steak is the true crowdpleaser, you can also cook up a mean lambchop or porkchop with dirty grilling—you can even use a salmon filet for your red meat-averse pals. Just be sure to use a thick cut. If you have lump charcoal at your disposal, use it—most of the other practitioners of this primal cooking style do, and they swear by it. But as you can see below, charcoal briquettes work just as well, if you're comfortable using them. Lump is made of wood only, is all-natural, and produces less ash, whereas briquettes are made up of a variety of things, may contain chemicals, and produces more ash. If you have any doubts on which you should use, go with lump. It's the safest bet. Start by heating your charcoal in your barbecue or grill. You'll want to heat the charcoal using a BBQ chimney, and not lighter fluid, or else the fluid will get on your steak (gross). 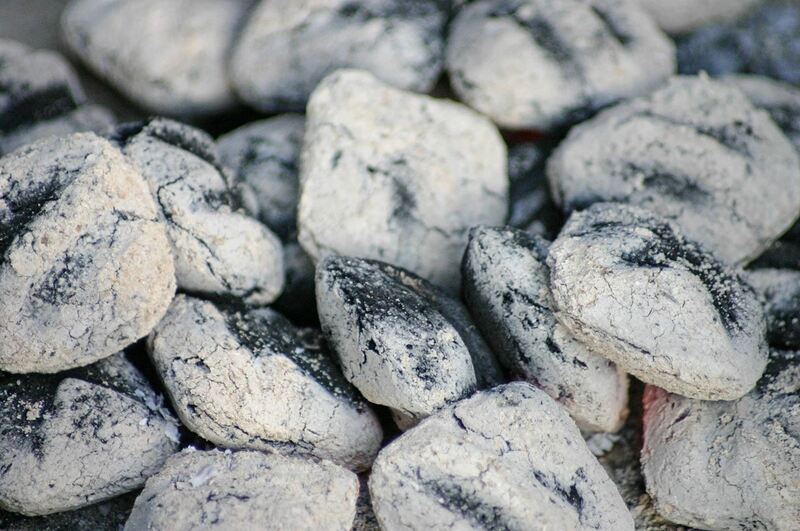 If using briquettes, make sure they have a good coat of white ash around them before cooking so that any unpleasant odors are less likely to be sucked into your food. Take your steak (or whatever meat you've chosen to use) out of the fridge, then add your usual, basic seasonings to it: salt, pepper, and a little olive oil. Dry rubs work very well for this method of grilling, too. Feel free to experiment. Place the meat directly on the super-hot coals, enjoy the amazing smell of cooked meat as it hits your nostrils, and try not to drool. Flames starting to lick the fat dripping off your steak? Good. No grill can reproduce that fire-seared flavor of direct contact! When the steak is cooked to your liking (which should be medium rare, as all the best cavemen know), remove it from the charcoals and let it rest. I know, it's tough to keep yourself from going into beast-mode and ripping into that hunk of meat. But trust me, your meat will taste much better if you give it a few minutes. Look at that perfectly-cooked steak: just a bit bloody with a crisp, charred crust. 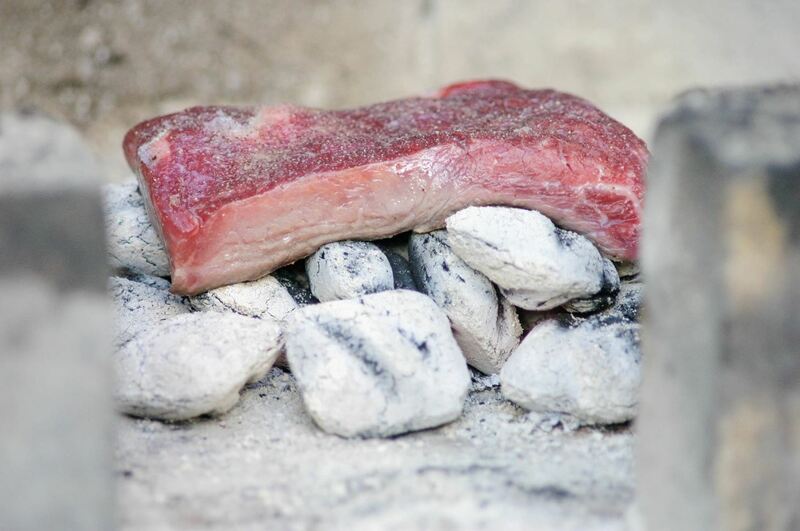 Have you tried flame-searing your own meat on direct coals? If so, tell us about your experience in the comments below. How To: Burn Your Tomatoes and Make an Amazing Dish!